Well that was tricky. My brain still hurts, trying to fathom what was going to happen next. It may well be the same for OOD Katie Shorrock. How do you set a course when the breeze is either an unsteady NE or unsteady SE, but virtually never anything in between, but still provide a decent beat or three? If you set different angles beats, Murphy’s Law says it will be SE on a NE leg and vice versa. Plump for one angle and the danger is there are no beats at all. Nonetheless, the race team managed to provide us with four proper, challenging races as the wind flicked and grew to hiking strength and faded every random-number of minutes. Would the next phase come from the right next time or left again? Who knew? In race one, FPSC’s own vice-commodore, Colin Dutton was on fire, leading and seemingly extending all the way for a comfortable win. 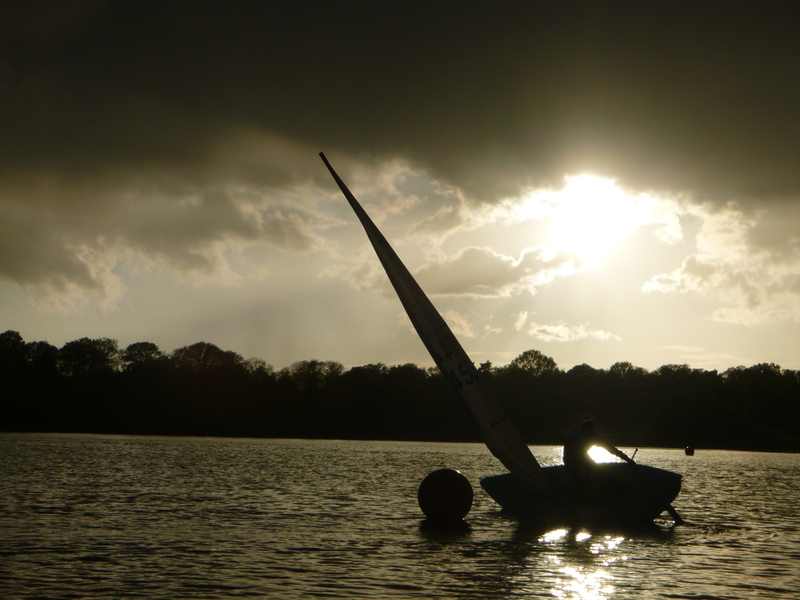 The pile-up at the first leeward mark perhaps left Colin grinning to himself as he serenely sailed off. Seems someone need a bit of a rules refresher too – you can’t unilaterally shout “no room” to 5 boats inside you all asking for it, gybe and shut the door on everyone. After that, things settled down a bit. Winner for the last two years, David Jessop had a great battle with Simon Hamment, also of Papercourt for second and third, with Simon coming out on top. Clive Eplett recovered from his failed ‘round the outside’ plan at that leeward mark for fourth. 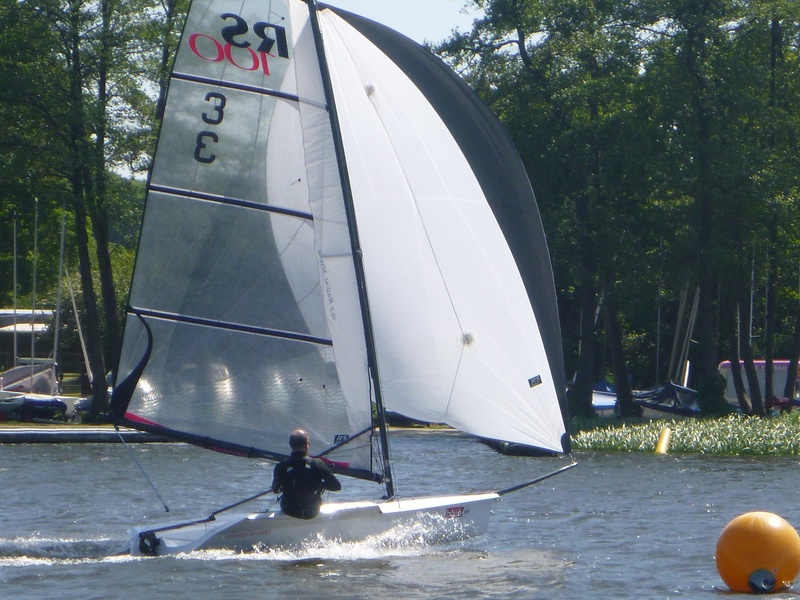 In race 2, it was Clive’s turn to hit the front for the first lap or so until Katrina Gilbert judged better whether it was right-wind’s turn or left-winds turn again, to take what looked like a safe lead – until the final 100 yards under the shore which made for a tense finish that Katrina eventually held. 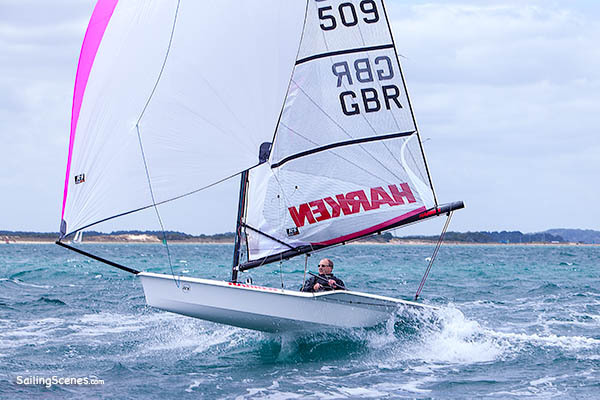 On a day where big gaps could appear then contract and even invert, John Peck of Silverwing led home the next group, followed by Dominic Hall (Papercourt), with 1, 2 and 3 in race 1 finishing 10, 7 and 8 respectively. Inevitably, the best-looking breeze of the day appeared whilst we enjoyed lunch, but, as forecast, there was, mostly, more breeze than in the morning. 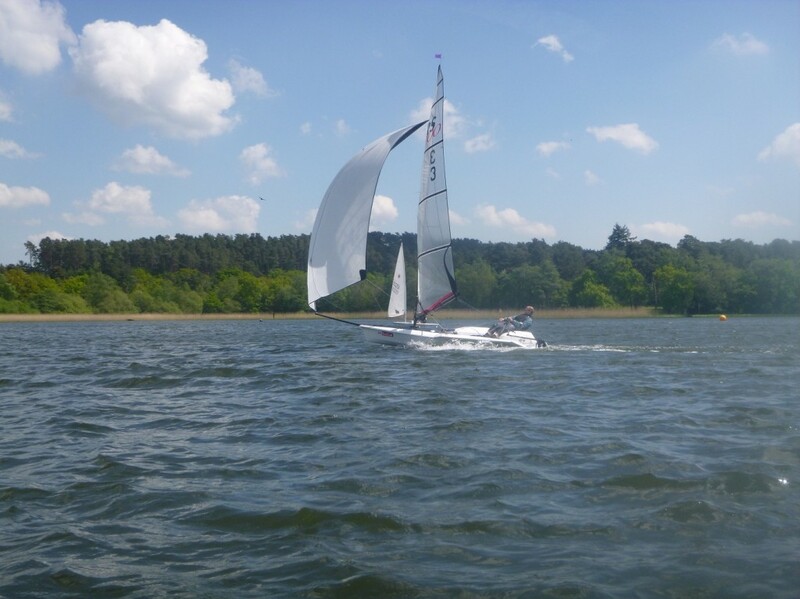 This time, Simon Hamment led from the off, initially chased by Clive, who was then overtaken by Nigel Rolfe (Burghfield). But oh no, there was no hoot as Simon crossed the line. The dreaded OCS, giving Nigel the win, Clive second and Frensham’s Rob Beere 3rd. David Jessop was 4th and Matt Hill were 5th. And where was Katrina? Almost unbelievably, ashore with a broken top-section and ripped sail. In a F2? I don’t think anybody had a clue what the scores were before the start of race 4. The racing was obviously intriguing enough to keep everyone interested – there seemed few breakers for the early shower anyway. The SE now seemed far more dominant, so Katie moved the start-line and gave us yet another course to try and figure out. The line was port-biased, but was that more pressure on the right? At the gun, the pin was pretty congested (was someone OCS?) but the leaders at the first mark, Colin and Clive had tacked onto port as soon as, taking a nice port-lift and pressure into the mark. Again there was no stopping Colin, horizon-jobbing everyone for the second time for the day. Matt Hill found his own private SSW to overtake Nigel and pressurise Clive for second, but not quite grasp the place. Multiple champion Roger Gilbert once said to me there are three aspects of success, getting there, staying there, doing it consistently. When the scores were counted, Clive’s (4),2,2,2 trumped Colin’s 1,(10),10,1 (wrong sort of consistent), with David Jessop grinding out 3rd overall with 3,(8),4,6 and Matt Hill taking 4th with a (8),5,5,3. The relatively high scores, with 10 different boats featuring in the top 4 finishers show what a tricky day it was, with great racing throughout the fleet. 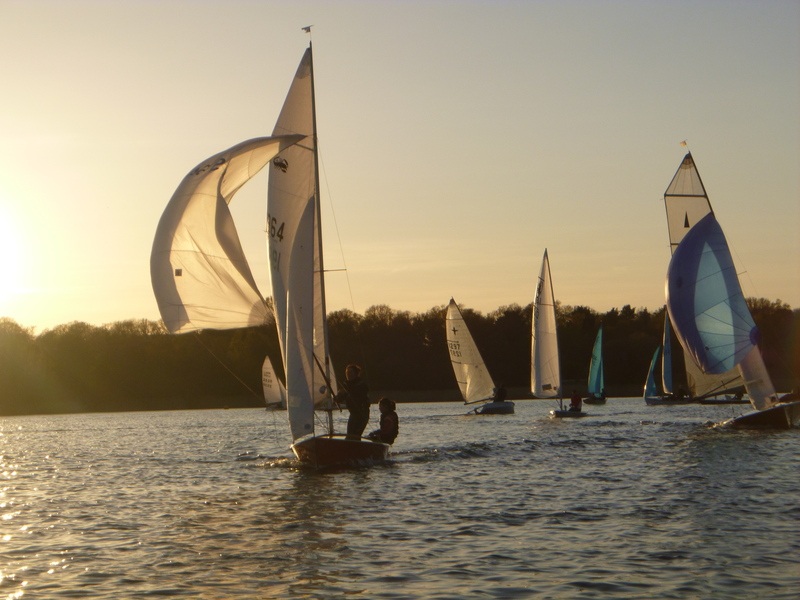 11 visitors was a recent record for an FPSC Laser Open, so many thanks to all those that travelled, swelling the fleet to 23 boats, so please come again. 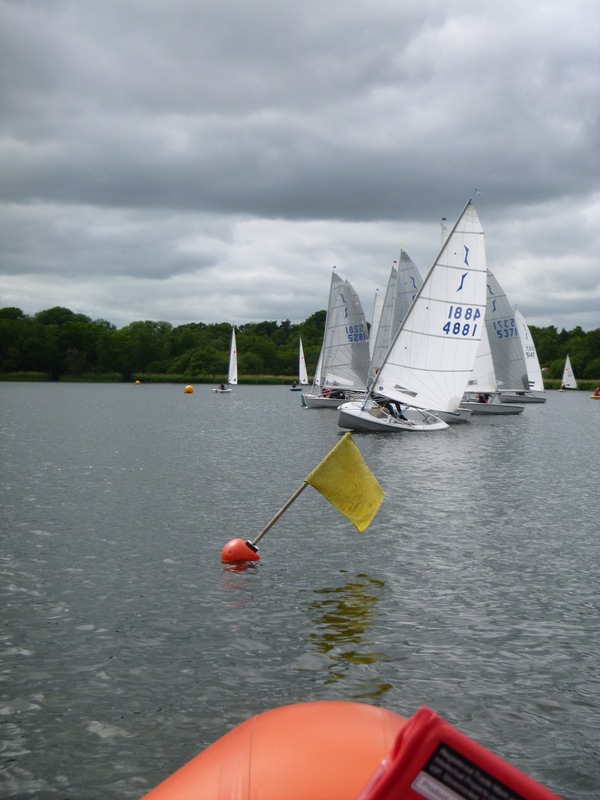 We hope Frensham provided you with some memorably challenging racing; it’s never over until it’s over on the Pond! I’ve always argued that the journalists concept of ‘will to win’ was total tosh. My view was more that winners absolutely hate losing, which is a far different thing. But, chatting to a local, virtually unbeatable, king of the river the other day he hit me with a new one: “I’d retire tomorrow if I knew no other <person> could win”. So in this instance, it is the thought of someone else winning that is the ultimate anathema, the unthinkable prospect that keeps out there and at the front.